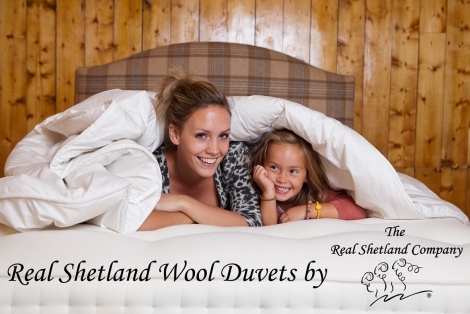 We are very proud to announce the release of our stunning new line of Real Shetland wool duvets. With 100% Shetland wool filling inside a soft 100% cotton casing these duvets feel like absolute luxury. Duvet weight is classified as Spring/Autumn weight (600gsm) which offers a tog rating between 8-14 tog. We have three standard sizes - single, double and Super King with custom weights and sizes available upon special request. Please note: we are currently out of our lovely king size duvets but we are making more and should have stock very soon. Please feel free to contact us for more information. Wool duvets are becomming more popular as not only are they more animal friendly than down and feather or synthetic fillers (wool is a sustainable resource with no harm coming to the wool when sheared) but wool is also breathable which means the body can regulate its own temperature during the night promoting deeper, sounder sleep. It is also an excellent option for those with allergies or asthma as wool is naturally resistant to dust mites as well as being safe for those who may react badly to down and feather (such as myself).